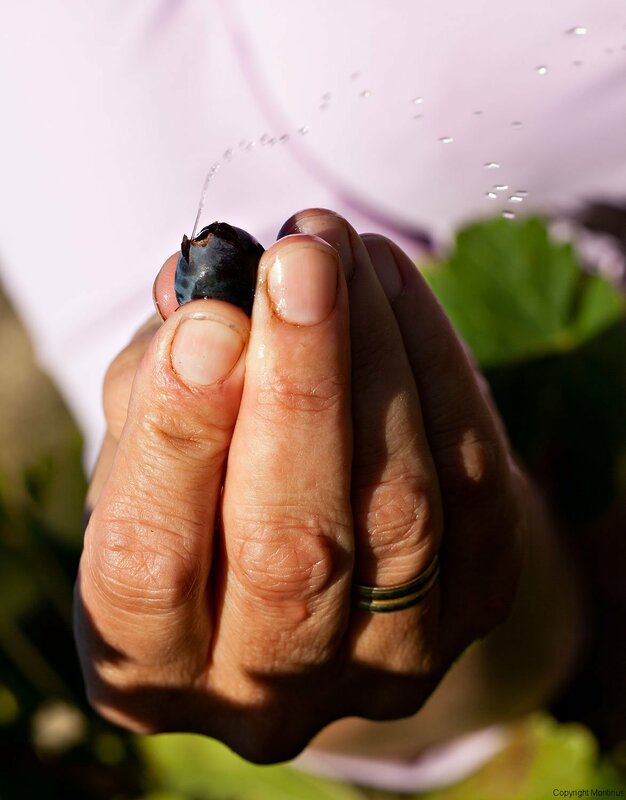 Our domain comprises mostly three main grape varieties, that is to say, three types of vines. We do ‘short pruning’ on all the vines, to favour the quality of the yield. 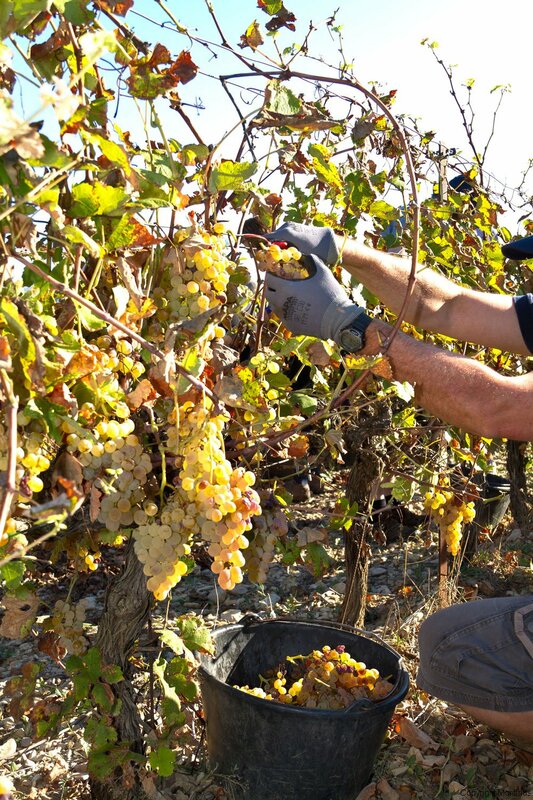 We believe that short pruning means better quality and avoids a green harvest. The strength of each vine is estimated and the pruning is adapted to meet its needs; we leave a different number of grapes on each one. In fact a weak vine in our view needs more pruning so as to leave fewer grapes and not have the vine over exerted during the vegetative cycle. 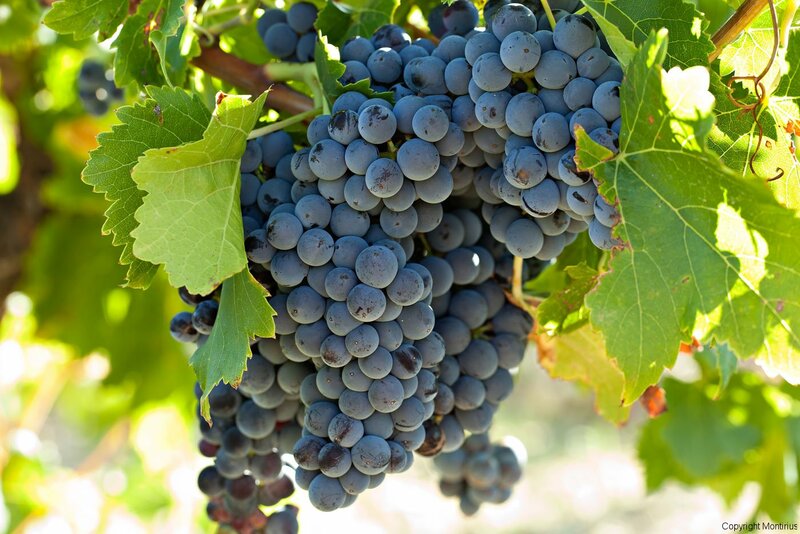 On the other hand, a more vigorous and stronger vine can produce and ripen a greater number of grapes. If we prune it too much, we end up with a Bonsai effect. 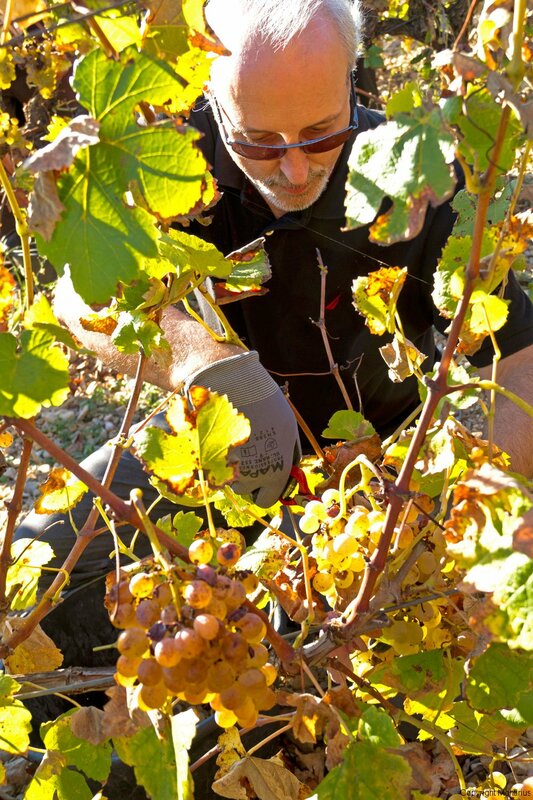 Careful and precise pruning also allows nurturing of the vines; it is a crucial time for them. 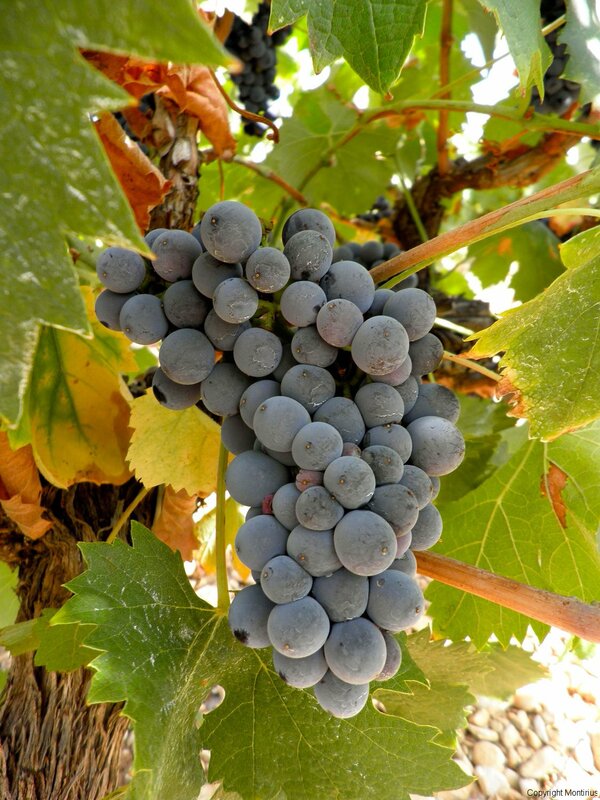 It is the main grape variety of our classified wines. The grape is truncated and compact with spherical berries. The leaves appear clipped in shape and of light green colour. It brings aromas of Kirsch, blackcurrant, pepper, liquorice and even violets, (violets found both on the nose and in the mouth). It is both supple and fleshy. It brings roundness and oiliness to the wine. 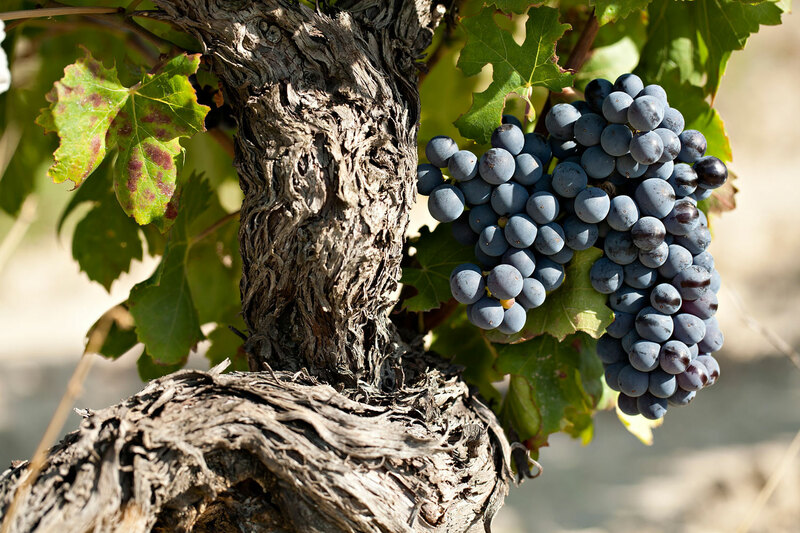 Grenache grows on the limits of the zone where it can thrive. More to the north, it cannot come to maturity. It is known however that vines give of their best quality when grown in extreme survival conditions. 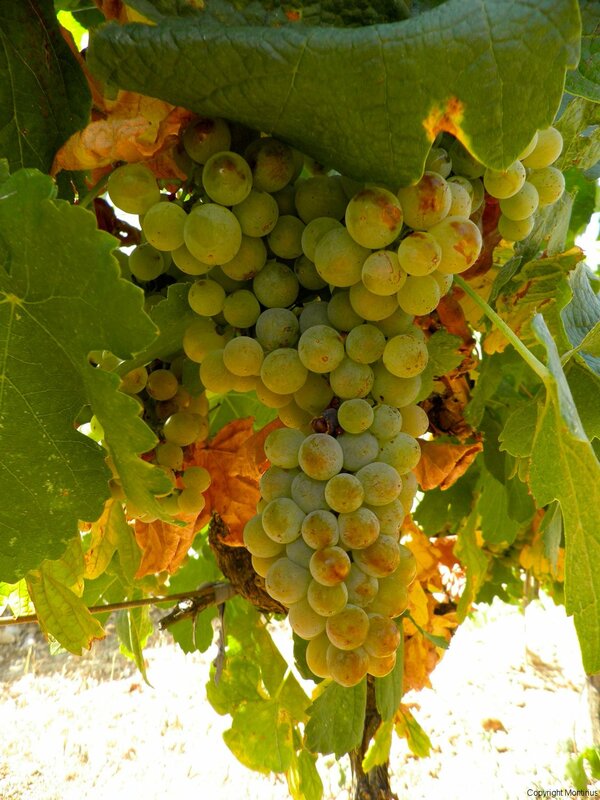 This vine variety is a pledge of quality for our wine classifications. However, it is a capricious vine, highly sensitive to the cold during flowering. The cold can provoke flower abortion; it is also sensitive to mildew. While all wine growers are in agreement about the virtues of this grape variety, few dare to grow it… Very coloured and beautifully structured, it bring complex aromas of wood, fine leather and resists oxidation very well. Given its capricious nature, it is unlikely more of it will be grown in the future; only perhaps by those who are adventurous and passionate. It gives aromas of leather, truffles, of fresh mushrooms and bark which are magical. 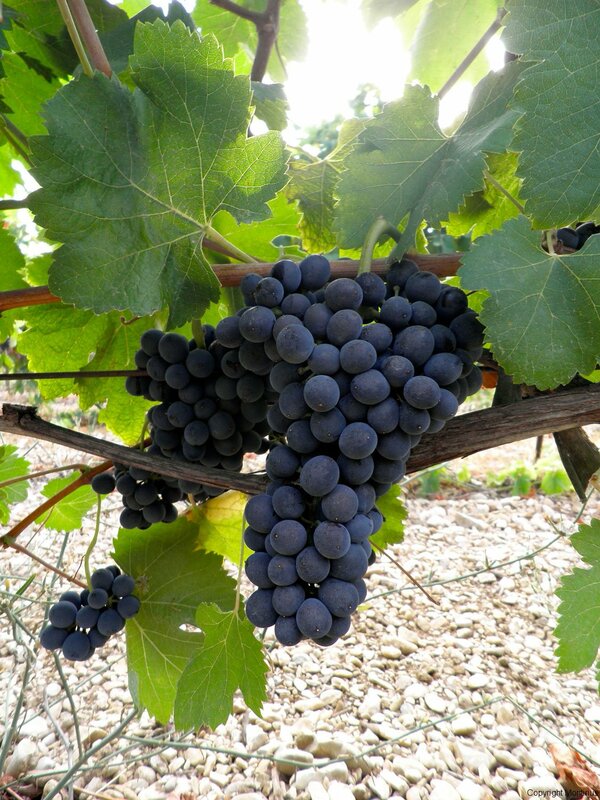 Mourvèdre ripens very late because it is outside its preferred geographic zone which is more to the south of France. 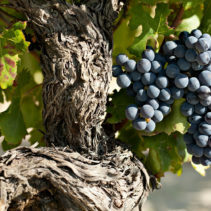 To obtain its full maturity, it is necessary to work it in a different way from the other vine varieties of the region. For example, it does not tolerate topping. 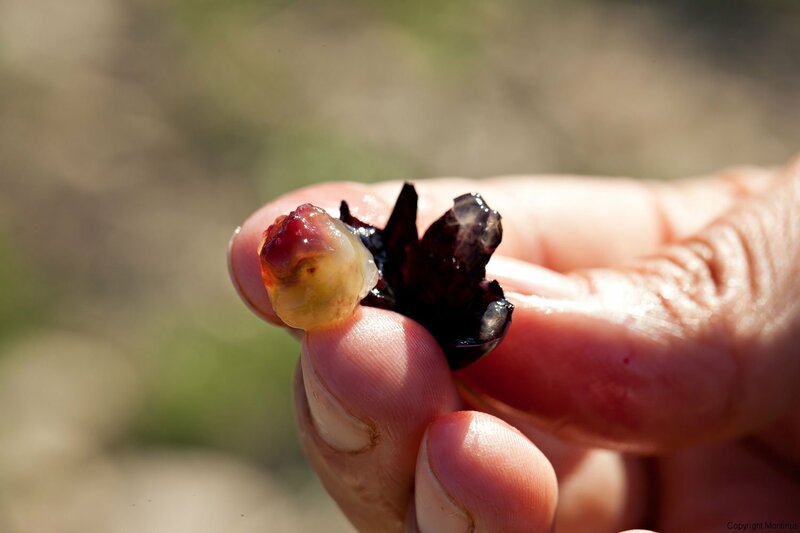 The shape of the grape is conical, the leaves are orbicular, flat, large and tooth like, with a cottony limb underneath. It is a fragile vine variety, needing a lot of attention. It is very sensitive to the Mistral (the northern wind), which can break the young branches in the spring. We trellis these vines higher than the Grenache and the Mourvedre, because it has internodes (the distance between two leaves) larger than the other vine varieties. 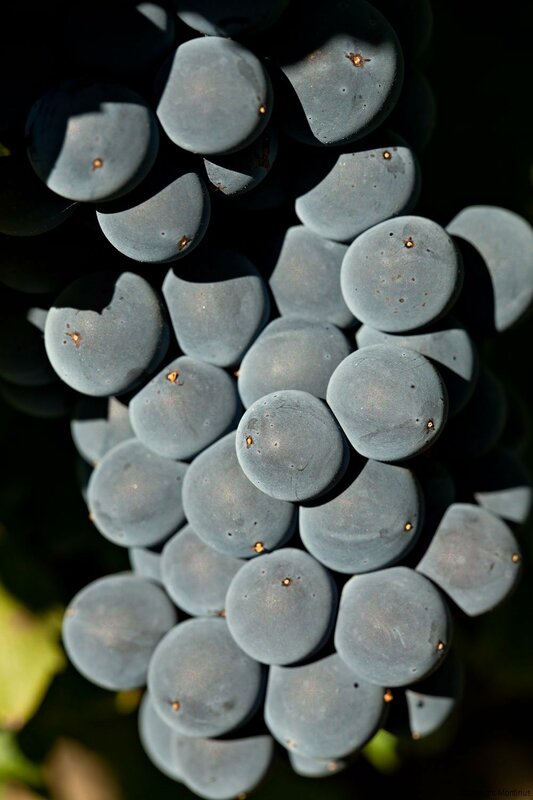 Syrah brings lots of anthocyanins and tannins. It gives us complex aromas of red fruits, (black cherries, raspberries), liquorice and blackcurrant with hints of vanilla. 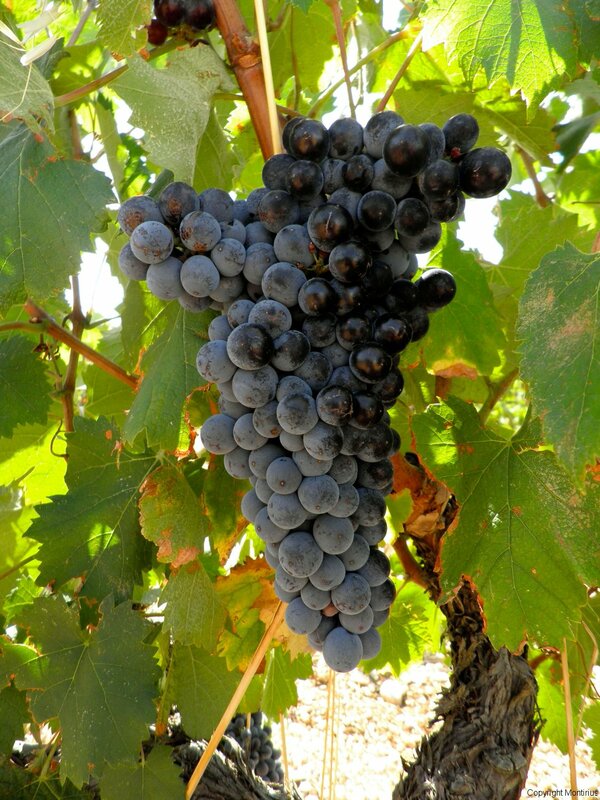 The shape of the grape is long and its leaves are orbicular and slightly embossed dark green. Bio-Dynamic culture and a Quebec study of forests made us realise the importance of mixed planting of vine varieties in our domain. 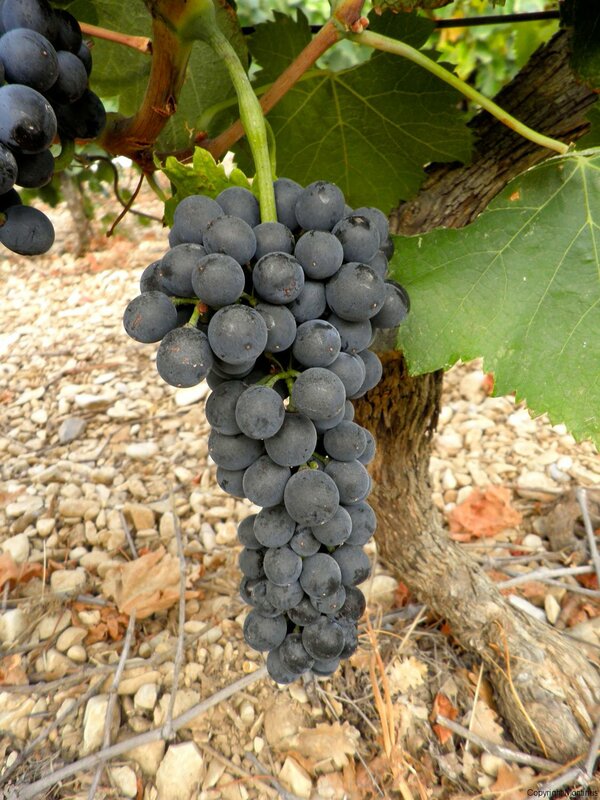 For the Vacqueyras classification, we alternate one vine of Grenache and one of Syrah. 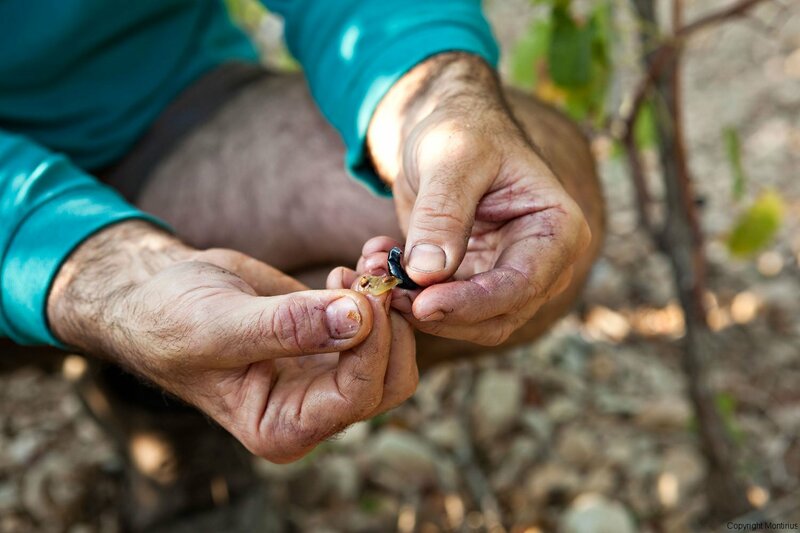 For the Gigondas classification, we alternate one vine of Grenache and one of Mourvèdre. We noticed with time that mixed planting of vine varieties started a better flowering in spring, and less aborting of flowers in the Grenache vines. We also noted better pollination of the vine flowers, and less insufficiency of magnesium in the Mourvèdre vines. 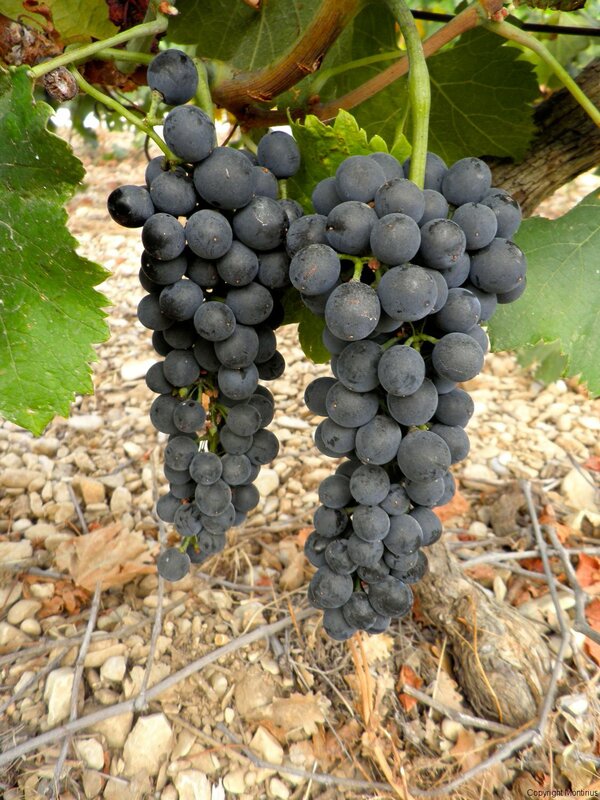 The Syrah and Grenache grapes marry wonderfully in the Vacqueyras blends. The Grenache and the Mourvèdre marry well in the Gigondas blends. In fact the two grape varieties in both cases are complementary and their blending takes nothing away from their respective qualities, rather it creates a magnificent symbiosis. 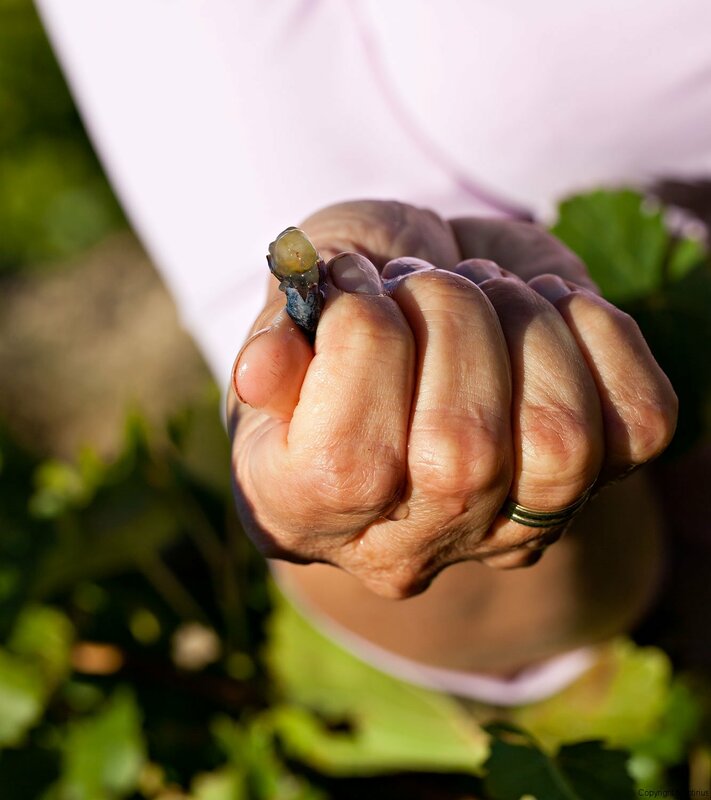 When mature, the seeds bring aromas of woodiness, grilled almonds and nuts to the wines. 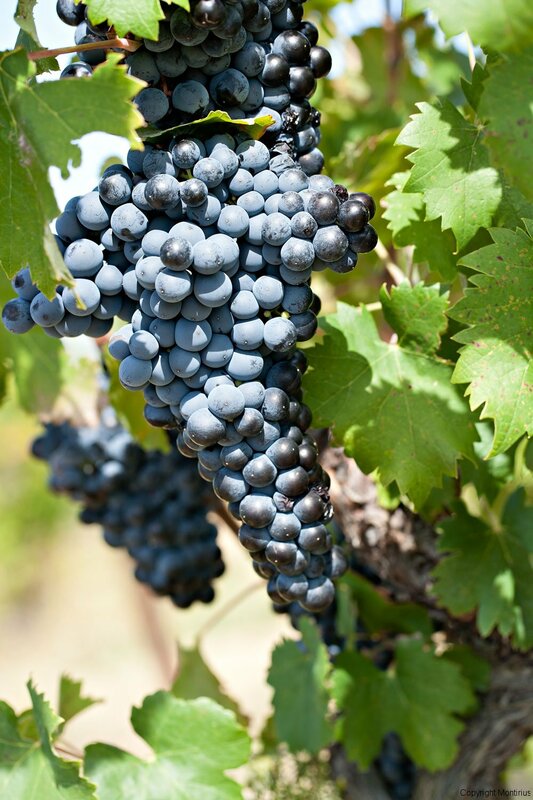 As with its brother the black Grenache, the grape is truncated and compact with spherical berries. The leaves appear clipped in shape and of light green colour. 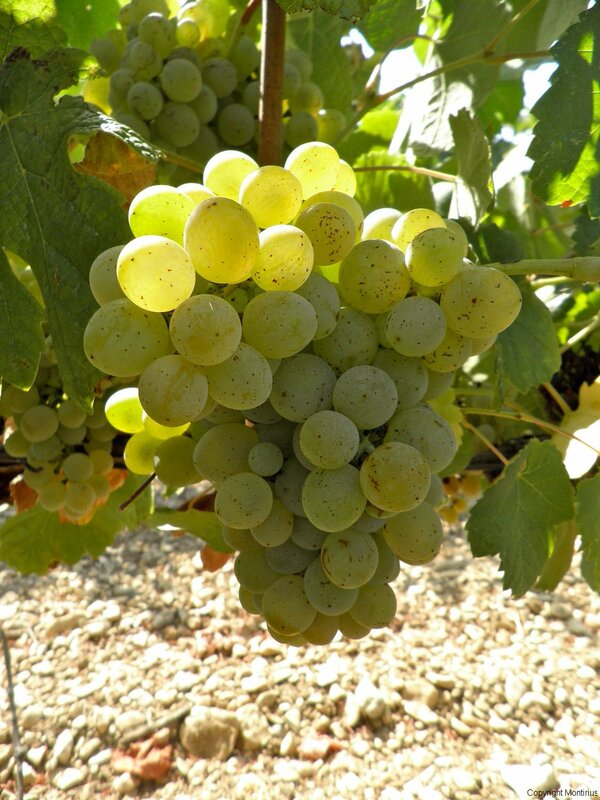 They bring aromas of citrus fruits with a roundness and oiliness to the wines. It is grown on the limits of the zone in which it can thrive. More to the north, it cannot mature. It is a capricious vine, highly sensitive to the cold during flowering. The cold can provoke flower abortion; it is also sensitive to mildew. 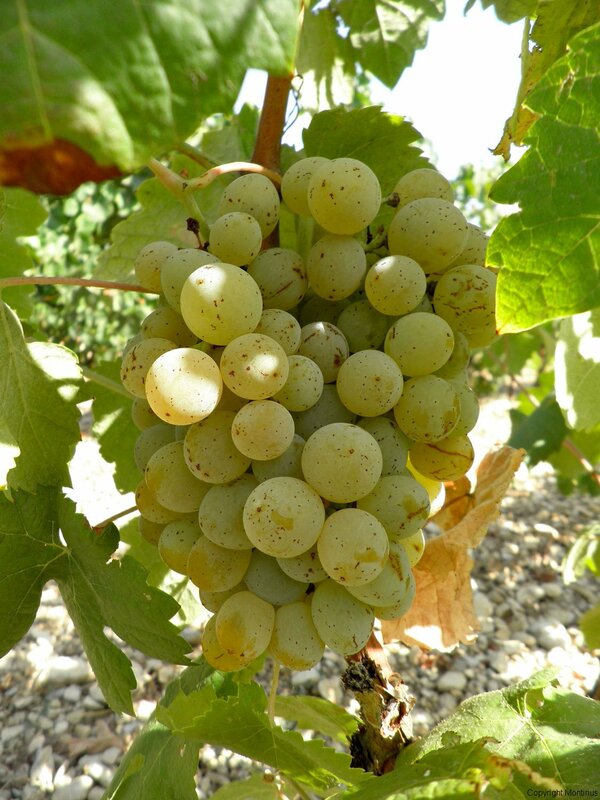 It is a fragile vine variety, sensitive to both dry conditions and mildew. Its name comes from the reddish colour it shows when mature. This reddish colour can give an amber colour to the white wine in certain years. 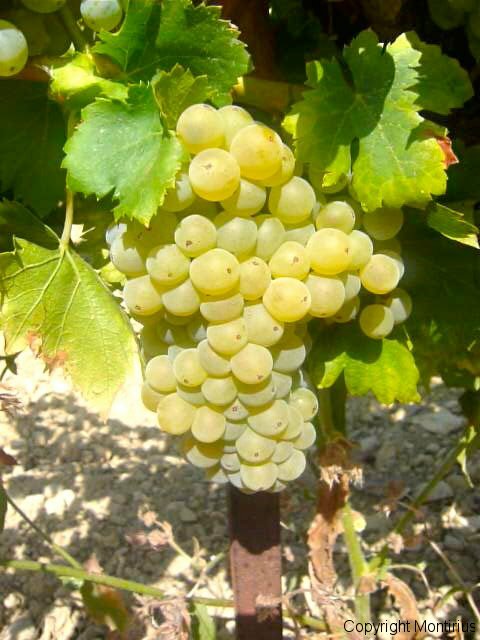 It is very aromatic and reveals aromas of white flowers and honey. Its shape is cylindrical, compact and small. Its gold colour is almost reddish at full maturity. Its leaves are big, indented, deeply lobed, with an intricate cone. It is a vine variety which resists infections and weather conditions. 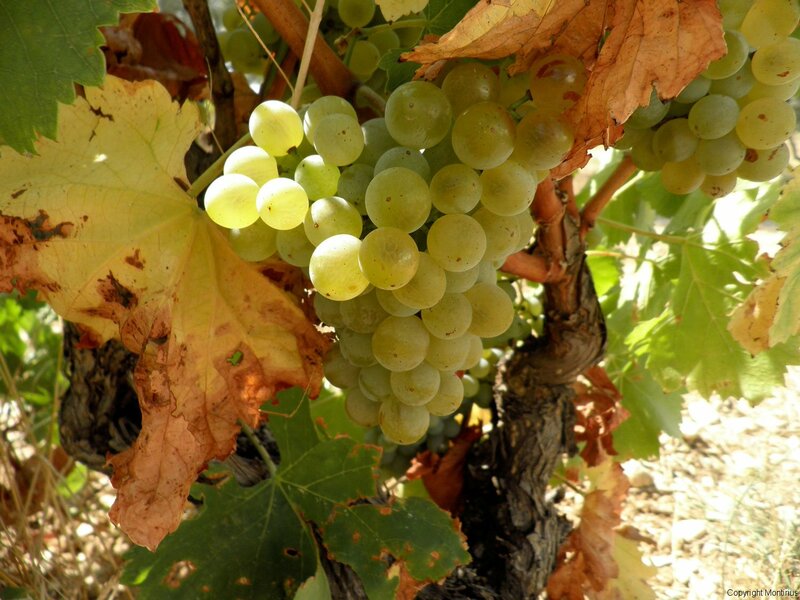 It is an old forgotten vine variety which Eric SAUREL re-planted in 1994. For him, it’s a little liked variety of preference, giving birth to a lovely wine, but it needs patience and to be understood. 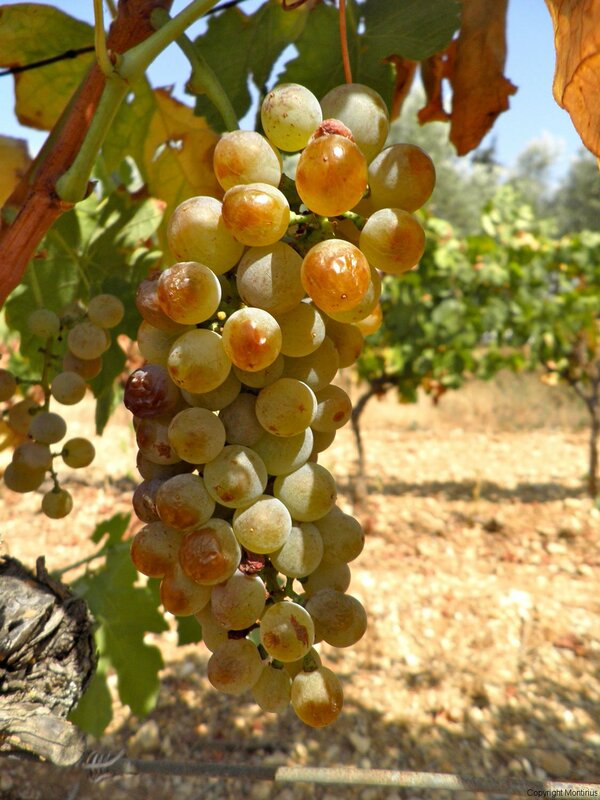 The feature of this variety is it matures late in this region. 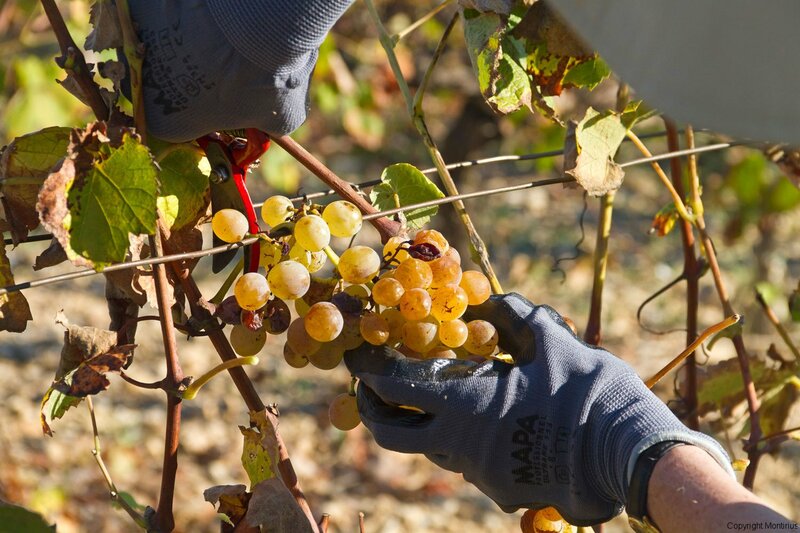 To harvest it at its full maturity, it is often necessary to be patient until the end of October or beginning of November; a full month after the end of the harvesting of the red grapes. It brings minerals and freshness to the wine. 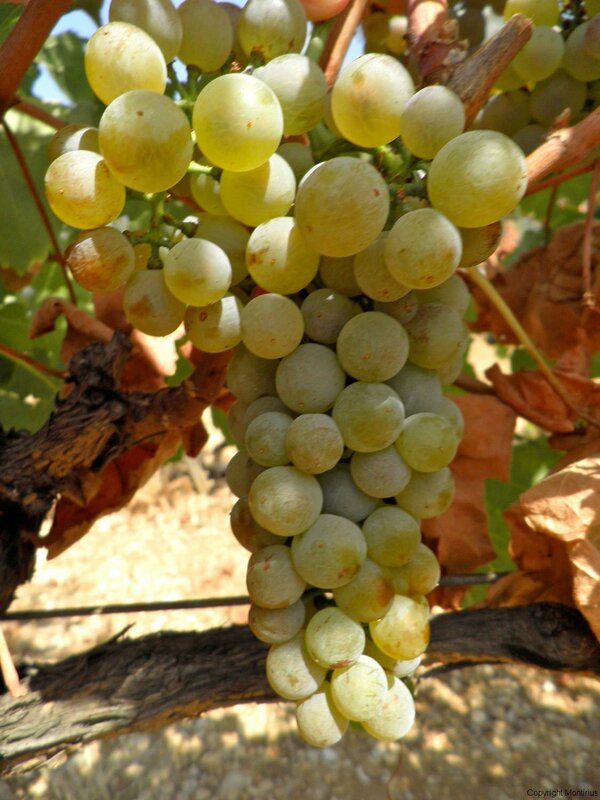 The grape shape is cylindrical/conical with ovoid or slightly ellipsoid berries. The leaves are orbicular, thick and bubbled, with a white felted duvet aspect. 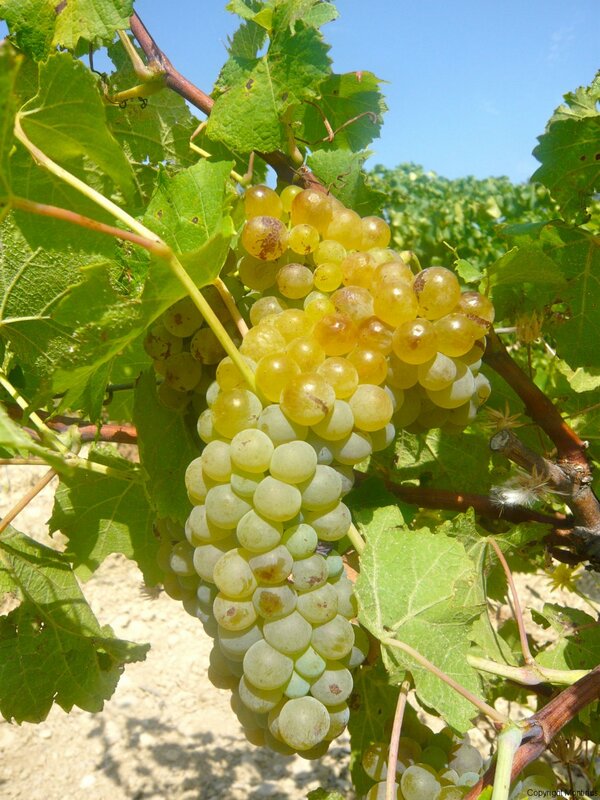 White Grenache and Roussanne mature at the same time and are vinified at the same time each year. The harvest is at the beginning of September. 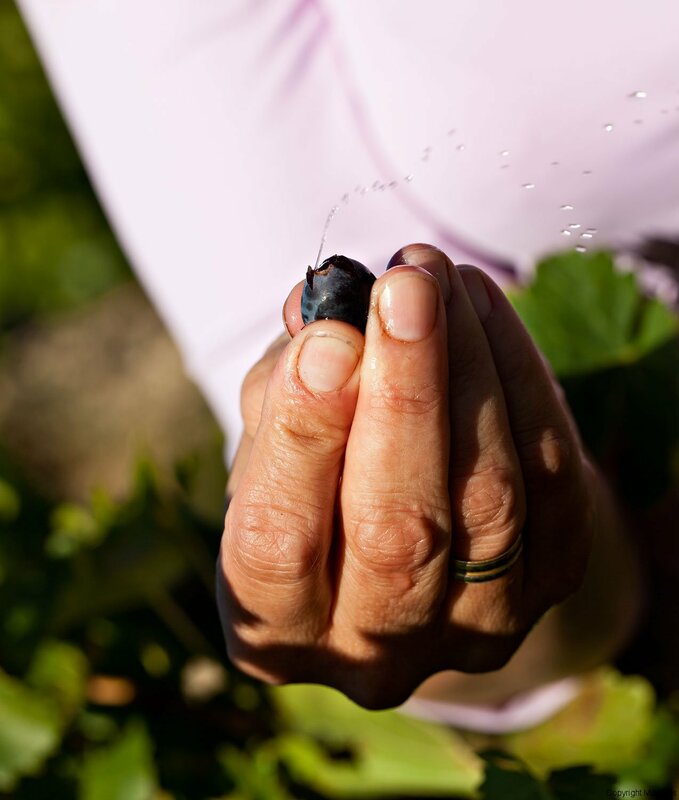 For us the Bourboulenc represents the architecture of the blending of three varieties which allows the Grenache and the Roussanne to express their full potential.